Welcome to the fun and rewarding world of digital video production! Using Learn iMovie in a Day you can master virtually all of the features of the iMovie program in just a few hours. This concise book gives you the tools to plan, edit and distribute an effective video production. 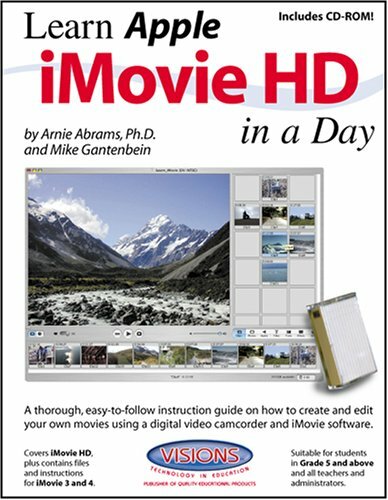 Covers iMovie HD and contains files and instructions for iMovie 3 and 4 for Macintosh. Suitable for 5th grade students and above and for all teachers and administrators. Michael Gantenbein is an instructor in Applied Multimedia and Computer Science at Southern Oregon University in Ashland, Oregon, where he teaches students how to create multimedia of many types. He shares 20 years of experience in the television and video production industries in the classroom, as well as 8 years in web design. Dr. Arnie Abrams is full professor of Educational Technology and director of the Applied Multimedia program at Southern Oregon University, where he has taught for 25 years. He regularly speaks at conferences across the country, and is author of top selling titles for Visions Technology.